Resolution: You may be prompted to provide the path of the driver. Windows may have the driver built-in, or may still have the driver files installed from the last time that you set up the device. If you are asked for the driver and you do not have it, you can try to download the latest driver from the hardware vendor�s Web site. In the device properties dialog box, click the "Driver" tab, and then click "Update Driver" to start the "Hardware Update Wizard". Follow the instructions to update the driver. If updating the driver does not work, see your hardware documentation for more information. Description: App windows.immersivecontrolpanel_6.2.0.0_neutral_neutral_cw5n1h2txyewy+microsoft.windows.immersivecontrolpanel did not launch within its allotted time. Description: The program SystemSettings.exe version 10.0.14393.82 stopped interacting with Windows and was closed. To see if more information about the problem is available, check the problem history in the Security and Maintenance control panel. Description: The program MicrosoftEdge.exe version 11.0.14393.576 stopped interacting with Windows and was closed. To see if more information about the problem is available, check the problem history in the Security and Maintenance control panel. Your system is low on virtual memory. Windows is increasing the size of your virtual memory paging file. During this process, memory requests for some applications may be denied. For more information, see Help. Description: Remote Access Connection Manager failed to start because it could not load one or more communication DLLs. Ensure that your communication hardware is installed and then restart the Remote Access Connection Manager service. If the problem persists, contact the system administrator. There was an unknown error. Code Integrity determined that a process (\Device\HarddiskVolume3\Program Files\Windows Defender\MsMpEng.exe) attempted to load \Device\HarddiskVolume3\Program Files\Common Files\microsoft shared\OFFICE12\MSOXMLMF.DLL that did not meet the Custom 3 / Antimalware signing level requirements. Code Integrity determined that a process (\Device\HarddiskVolume3\Program Files (x86)\AVG\Av\avgidsagenta.exe) attempted to load \Device\HarddiskVolume3\Windows\WinSxS\amd64_avg.vc140.crt_f92d94485545da78_14.0.24210.0_none_69fa0197d9b096ae\msvcp140.dll that did not meet the Custom 3 / Antimalware signing level requirements. Code Integrity determined that a process (\Device\HarddiskVolume3\Program Files (x86)\AVG\Av\avgidsagenta.exe) attempted to load \Device\HarddiskVolume3\Windows\WinSxS\amd64_avg.vc140.crt_f92d94485545da78_14.0.24210.0_none_69fa0197d9b096ae\vcruntime140.dll that did not meet the Custom 3 / Antimalware signing level requirements. My name is Joeicam , you can call me Joe, and I will be assisting you every step of the way. Please Note: I am still in training and my fixes have to be approved by my instructor, so there may be a slight delay in my replies. Look at it as a good thing though, since you have two people looking at your problem. If you have any questions or comments, or aren't quite sure about what to do, STOP AND ASK. Back up your files and folders, as sometimes malware infections can be severe. It's a good habit to plan for the worst. Please follow my instructions exactly, and do not repeat any steps more than once, unless instructed. Copy/Paste entire contents of your logs, and submit inside your post, instead of submitting as an attachment, unless told otherwise. As malware removal can be a complicated, multistep process, you should stick with me until I declare your system to be clean of all threats. It may seem like your system is running properly, but that does not mean that the infection is completely gone. You must reply to this post within four days, if you do not, then the topic will be closed. However, if you need more time to run the tools and fixes, or would like your topic to be reopened, please PM me or any Moderator to reactivate your topic. If I have not responded to your post within 24 hours, then send me a private message (PM). Otherwise, all communication is done in the forums. The fixes presented are specific to your problem and should only be used for the issue on this machine! I am currently in the process of reviewing your logs, and will reply with further instructions soon . Hey Mike! Pleasure to be working with you . Happy to be of assistance. Please continue with the following steps. 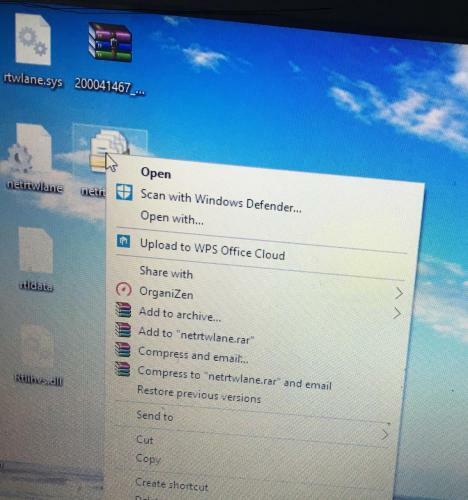 Step 3 will require you to download software, so download that to your good machine and transfer that to your desktop on the machine that isn't working. This kind of program can be good for your PC, but take caution with the registry cleaner portion of the application. A registry cleaner will not increase your system's speed or performance, but it can damage your Registry, which can lead to an unbootable machine. Note: During the uninstall process, some of these programs will attempt to scare you into keeping the program installed. However, know that these are indeed malware related. If you do not understand a certain message, please contact me about it. It's not much, but definitely a start . Put a checkmark in the Select All checkbox. Ensure that "All" is selected next to List Devices. Click Go and copy/paste the results MTB.txt into your next reply. A copy of MTB.txt will be saved in the same directory the tool is run. Description: Exception while generating JSON: Input string was not in a correct format. %%2147942405 = Access is denied. 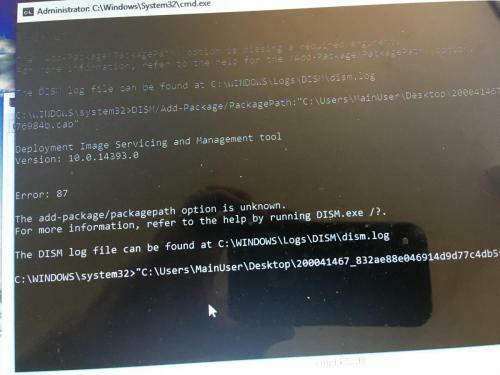 Description: Code Integrity determined that a process (\Device\HarddiskVolume3\Program Files\Windows Defender\MsMpEng.exe) attempted to load \Device\HarddiskVolume3\Program Files\Common Files\microsoft shared\OFFICE12\MSOXMLMF.DLL that did not meet the Custom 3 / Antimalware signing level requirements. Description: Code Integrity determined that a process (\Device\HarddiskVolume3\Program Files (x86)\AVG\Av\avgidsagenta.exe) attempted to load \Device\HarddiskVolume3\Windows\WinSxS\amd64_avg.vc140.crt_f92d94485545da78_14.0.24210.0_none_69fa0197d9b096ae\msvcp140.dll that did not meet the Custom 3 / Antimalware signing level requirements. Description: Code Integrity determined that a process (\Device\HarddiskVolume3\Program Files (x86)\AVG\Av\avgidsagenta.exe) attempted to load \Device\HarddiskVolume3\Windows\WinSxS\amd64_avg.vc140.crt_f92d94485545da78_14.0.24210.0_none_69fa0197d9b096ae\vcruntime140.dll that did not meet the Custom 3 / Antimalware signing level requirements. Resolution: You may be prompted to provide the path of the driver. Windows may have the driver built-in, or may still have the driver files installed from the last time that you set up the device. If you are asked for the driver and you do not have it, you can try to download the latest driver from the hardware vendor’s Web site. Just that when you tell me to download something (in this case MiniToolBox) I download it on my desktop and put it on a stick and then run it on the laptop. Okay, yes, let's continue this process, it's working nicely until we get the internet back up and running on your laptop. Download this Realtek Wi-Fi Adapter driver and place it on the desktop of the computer where the Internet isn't working correctly. Don't install it yet, as we need to uninstall the old driver first. 1. Right-click the Start button, then select Device Manager from the context menu. 2. Under Network adapters, search for Realtek RTL8188EE 802.11 bgn Wi-Fi Adapter. Right-click and click on "Uninstall"
4. Right-click the .cab file on your desktop, and select "Install"
I'm having a problem. I downloaded the .cab file you told me to onto my desktop, transferred it to the laptop and uninstalled the Realtek RTL8188EE 802.11 bgn Wi-Fi Adapter. 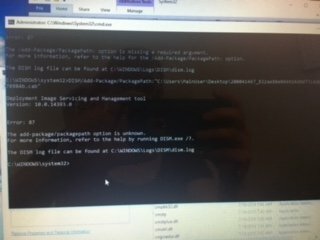 After restarting the computer I unzipped the file and nothing is a .cab file. The main icon that comes up is netrtwlane and when I double-click that all that comes up is a Security Catalog. A better picture of the Error 87 (sorry about the lighting and the reflection of the iPhone!